I love old movies. I get very frustrated with contemporary people who review old movies as if they were just made. 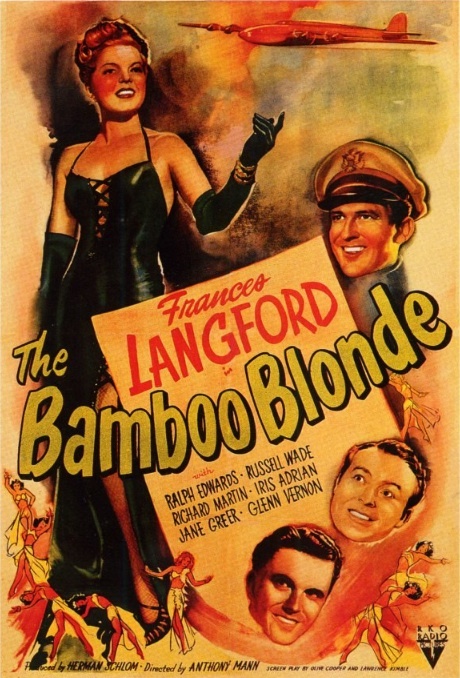 The Bamboo Blonde was filmed in 1946 with 1946 actors, with a1946 script and a 1946 world view. It doesn’t have surround sound or 100 car crashes or the F bomb. It was made for a 1946 world that required of a film, a good story, a beautiful woman, a handsome man. These were the basics surrounding the basic love story. The Bamboo Blonde was right for its time. The end of the war, looking back already at wartime romances. It should be viewed in its context and appreciated in that context. Frances Langford lights up the screen from the very beginning. Her honey voice bringing out all of the nuances of her songs which unfortunately are very under rated. Watch her facial expressions in Dreaming Out Loud. So put on your fedora and escape to another time and enjoy this wonderful film. Thanks for your comment, Charles. One reason I started this blog was to get out of a contemporary mindset and immerse myself in a different world of film. I also listen to old radio shows day by day. This summer Jack Paar is substituting for Jack Benny on Sunday nights on NBC. It is the summer of 1947, after all, at least for me. I actually saw “The Bamboo Blonde” at Film Forum, on the big screen, so it has a special place in my heart. It’s not my favorite Anthony Mann movie (his flick “Desperate,” which I recently reviewed, is more up my alley), but I so rarely get to see these movies in a theater, on a big screen, with a really clean, nice-looking print, so it was a very enjoyable experience last summer to watch it. Stop by again! I hope you enjoy my other reviews. An interesting note about “The Bamboo Blonde” is that it was an inexpensive programmer made with (what was considered then) second tier talent. Langford tried through the 30s and 40s but could not establish herself with any of the major studios. Because of her incredible voice, she was well-known and very popular as a recording and radio star. If you can view this movie as a product and reflection of 1946 America, it is interesting and entertaining.